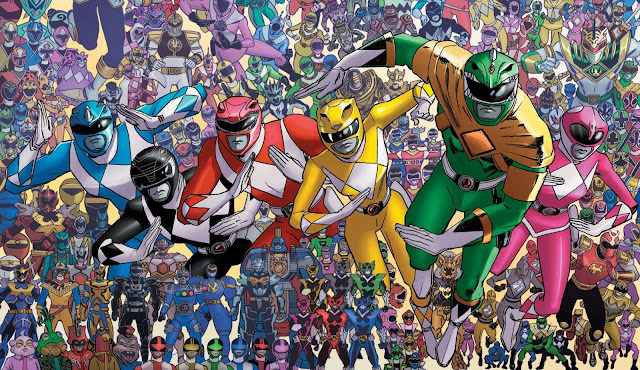 The various incarnations of Power Rangers for the "Shattered Grid" comic event. Power Rangers was a simple idea: use existing footage from a Japanese action show, incorporate new American footage to tie it all together, and voila! Now, 25 years later, it’s a multi-media powerhouse with an immense number of toys, video games and comics—and it’s still going! Despite changing hands between Saban and Disney, back to Saban and now Hasbro, Power Rangers has been the one constant this quarter century. This month, the month where it all began, we’ll be celebrating the long-running franchise by covering several of its various incarnations. We had already done Mighty Morphin Power Rangers and Mighty Morphin Alien Rangers (so be sure to check those out! ), but we’ll be finishing up the first Saban era of the franchise and the beginning of the Disney era (with a little extra dose of RPM, your blogmaster’s favorite incarnation). Share your Power Rangers memories with us! You can find us on Facebook here or here, or on Twitter @SatMForever. You can also comment directly to any post here on the blog.